Hi there, and thanks for coming to read my review of the Orion 10–25×42 Zoom Waterproof Monocular. This is a budget-priced optic, but it doesn’t appear to be short on features. Let’s take a closer look and see how well it stacks up against the competition. The Orion monocular is a mere seven inches long with a 42mm objective lens, and it weighs 12 ounces. Eye relief on this monocular is 14mm, and the close focus distance is a very convenient 20 inches, allowing you to closely examine objects near or far. The monocular’s accessories are halfway decent, but not terrific. The nylon carrying case is a rather tight fit, meaning you’ll end up pulling your pants up along with the case when you try to remove the monocular, and vice versa when you put it back. This monoc offers variable zoom from 10X to 25X. That would be great if the glass were heavy enough to keep steady when viewing, but at 7 ounces, there is just too much shake to really get the most out of the magnification. However, the monocular is tripod-adaptable, so it works fantastically well on a tripod. Just don’t try using it handheld beyond 10X magnification. Field of view through the monocular is 126 feet to 168 feet at 1,000 yards, depending on the magnification setting. That’s rather limited, considering the 42mm objective lens, but I’ve looked through worse. Like the fixed zoom Orion 10–42 monocular, this monocular uses a BK–7 roof prism, but the optics are only multi-coated. Images have decent detail, brightness, and contrast, but I’m not sure why Orion didn’t choose to use BaK–4 prisms or fully multi-coat the optics. The focus mechanism is a center wheel, and the focus wheel is just tight enough to turn to keep you from accidentally bumping it. The focus is smooth and clean, allowing you to get an excellent and crisp image of your subject, whether it’s nearby or a hundred yards or more away. Speaking of the image, it’s quite clear and vivid, but the edges of the monocular suffer from chromatic aberration, with a blue fringe around the perimeter of the monocular. This monocular is small enough to use one-handed, and it offers a good grip via the rubber exterior. It’s light and compact, and is reasonably protected against bumps and falls. Unfortunately, there are no lens caps included, so you should be careful not to allow the lenses to get scratched up. The bottom of the monocular has a tripod mount, so you can use the glass with any standard tripod. That’s a really nice feature on a budget optic, and it is necessary to get the most out of the glass at extreme magnifications. The monocular is waterproof and fogproof, thanks to O-ring seals and nitrogen-purging. The rubber shell provides plenty of impact resistance, and I’ve dropped the glass several times without any ill effects. My only real complaint is that it doesn’t include lens covers for either the objective lens or the eyepiece. How Well Does the Orion 10–25×42 Zoom Waterproof Monocular Work in the Field? The Orion 10–25×42 monocular doesn’t work great for field work, unless you’re willing to stick to 10X magnification. Its light weight and small size make it very difficult to keep steady at higher magnifications. With that said, from a tree stand with a rail, sometimes I can lean in and get a stable enough view to zoom in on a deer. With a small monopod, I’ve managed to successfully use the monocular to spot several bedded down deer. Thanks for reading this review of the Orion 10–25x42 Zoom Waterproof Monocular, a compact and budget-friendly optic. 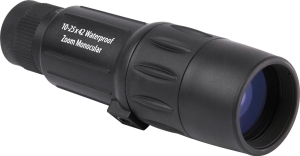 The monocular offers an excellent view of your target image, whether close up or far away. Unfortunately, there aren’t any lens covers and it’s too light to steadily use it without a tripod. There’s also a small amount of blue color fringing around the edges of the view.